RMI-25 provides superior cooling to glycol based, and waterless coolants…and, at a much lower cost! If you don’t need antifreeze, you don’t need glycol. RMI-25 will cool it by 7C…or more! Even a thin layer of mineral scale through the radiator and engine water jackets is a major barrier to efficient cooling! 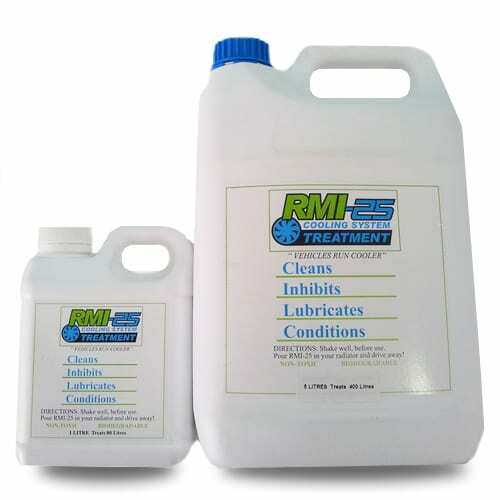 RMI-25 added to the coolant quickly dissolves mineral scale and sediment from conventional type coolants. Toyota Landcruiser Fleet: With over 100 Landcruisers in this WA mining fleet, an average 25 water pumps failed a year due to the hard water used. The seal lips go first, then the bearings. The first year on RMI-25 Cooling system treatment saw 1 failure. The second year no water pumps failed. Expect longer pump and hose life with RMI-25. 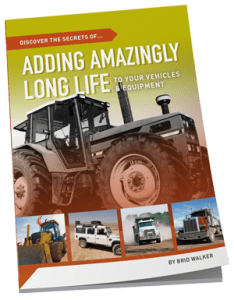 Want radiator hoses that last twice as long? A coolant that lubricates water pump seals? Want an end to aluminium corrosion under hoses? Want to eliminate stray current that can corrode radiators in under 12 months? RMI-25 is THE real life FIX! The RMI-25 is a concentrated additive designed to Clean, Lubricate and Protect your radiator. Why spend money on replacing expensive glycol when RMI-25 will clean and cool your entire cooling system while you drive. RMI-25 makes engines run cooler, prolonging engine life. 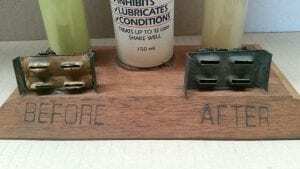 One Easy Application – Just pour some in your radiator and drive away. SAVINGS HISTORY: Has prevented water pump failures ($300 to $4000), and avoided engine loss caused by failed cooling systems in thousands of applications, saving rebuilds from $4000 to $200,000 plus. Most products cannot prevent scale build up on cooling systems surfaces, which therefore require caustic or acid bathing. RMI-25 breaks down solids to molecular size holding them in suspension, which discolours the cooling water to darkish brown. This colour change can occur within 6-10 hours of operation. When this happens, simply drain system, back flush and re-dose until cooling water retains yellow-green colour. At this point, system is perfectly clean and will remain so if dosed accordingly. RMI-25 Cooling System treatment can be added to all glycol based coolants or just used with water. Where anti-freeze is required, it should also be added. It is both a cleaner/de-scaler of the entire cooling system, as well as providing complete protection to all types of system materials. RMI-25 cleans (and keeps clean) cooling system and at the same time prevents corrosion, cavitation erosion and cylinder pitting. It lubricates water pump seals, heater control valves, drain plugs and virtually eliminates water pump failures, while preserving hoses, O-rings and seals. Unlike other cooling system treatments, RMI-25 is Non-Toxic and biodegradable, it is entirely safe to use in environmentally sensitive areas. 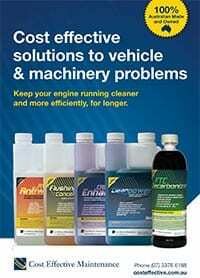 Just add the RMI-25 at 1 Litre per 80 Litres straight into your radiator. Drive away and when water turns darkish brown change fluid and backflush.